Note: This branch is now closed. You can now find BWNT at SM North City Annex. 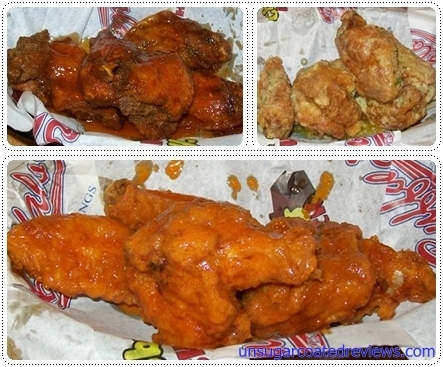 Craving for some buffalo wings, we dropped by Buffalo's Wings n' Things (BWNT) at Sgt. Esguerra in Quezon City for two consecutive Saturdays. We got to try their Beef Burrito, Chicken Quesadilla, Dirty Rice, Classic Twin Hotdogs, and of course buffalo wings! We ordered three kinds of wings: Garlic Parmesan, The Rookie, and New York's Finest. The Twin Hotdogs were smaller than we expected. I didn't get to try it, but bf said that he was not impressed. It tasted ordinary to him, just like the hotdogs found at the supermarket. In BWNT, the chicken wings have five levels of hotness: The Rookie, New York's Finest, Firehouse Classic, Nuclear, and Armageddon. In our first visit, we didn't know what to expect about the hotness of the wings (Buffalo Wild Wings' tamest was already hot enough to make us sweat), so we played safe and ordered the least spicy - The Rookie. Its heat was very manageable, perfect for those who want a bit of spice but have low tolerance for hot food. In our next visit, we got their New York's Finest. Its heat was more suited to my preference; next time we'll try their Firehouse Classic. The Garlic Parmesan was okay, but I like the spicy ones more. The BWNT buffalo wings were greasier than others we've tried, by the way. The Dirty Rice had a mild flavor and went well with the buffalo wings. I think it's a tastier partner than plain rice. The chicken wings were good whether eaten as is or eaten with their bleu cheese dip. I liked that the dip's taste was not as strong as other bleu cheese dips I'd tried. I enjoyed their Beef Burrito. It was served already sliced in half, making it easy for me to share my food. Unlike Mexicali, there were no sauces for the burrito, just the salsa. The burrito was tasty and already hot and the salsa was good so I didn't miss the red and white sauces I usually use with burritos. I liked BNWT's salsa. I am usually maarte, este picky, with my food, in particular with onions (I don't eat onions - I don't mind the taste but I hate biting into an onion bit, no matter how small, so I always remove them or ask the restaurant not to put them in my food). With BNWT though, I was able to set that pickiness aside and enjoy the salsa. I was surprised. The Chicken Quesadilla was so much better than I expected. It was bf's order and I wasn't very thrilled about it at first. I just got one to have a taste but after trying it, I got hooked. The tortilla was soft and the fillings were flavorful and sticky enough that the quesadilla was not messy to eat. BWNT has a bright and cheery interior and a casual ambiance. The red, orange, and yellow pipes on the ceiling give the place a playful touch. The place is not that big but going around is easy and you don't feel cramped. A television on one corner plays sports shows. There is a wash area although its location is not obvious unless you're sitting near it. It would have been better if there is a sign pointing to it. The sink is located at the right side of the Interstate 90 sign. There is also an exterior dining area for smokers and those who want to dine al fresco. If you're going back to work or will be meeting someone after eating, it's better to dine outside to minimize the chance of your clothes smelling like food. After our second visit (we dined inside), we smelled like burritos the rest of the night. Noise is contained in the interior dining area. During our first visit, there was a large, noisy group. Due to the small size of the place, the sound was amplified and bf and I couldn't hear each other even though we were sitting next to one another. Two other pairs of customers probably had the same problem since we saw them transfer to tables outside. The restaurant is clean. Paper napkins are available at the tables. The liquid soap at the sink is a bit watery and the water output from the faucet is weak, but they are good enough to get rid of the grease and the smell on your hands after you've handled your food. The service is good. The menu is compact and simple (but made sturdy through lamination) and the reduced cost for making the menu enables BNWT to have a copy at every table, even the vacant ones. Newly-arrived diners can therefore choose at once instead of having to wait for or asking for the menu. The food also arrives quickly and the servers are polite and efficient. I always wonder why buffalo wings are called as such. Buffaloes don't have wings. What I want to try here is the spicy buffalo wings. I want to know if I can handle the Armageddon. They're called buffalo wings because they were first served in a restaurant in Buffalo, New York. no wonder the twindogs looked familiar, i think i've been able to taste a similar kind (with veggies on top), American din yung nagluto, but i've never been here. Food looks enticing though. :) Delicious! The hotdogs looks very tasty. I miss those kinds!!! The burrito looks good, will definitely try that! I suddenly crave for burrito. I haven't tried this place, but interesting that the prices are affordable for a resto that offers mostly American Food. This is a very comprehensive review, nice post! These are all of my favorite foOd ,I love Mexican food, they are very flavorful. The hotdog sandwich looks delicious,is that an onion or sauerkraut, coZ i like it better with sauerkraut just like the New York hotdog. Borritos.. quesadillas so love.... Will try this one out once I set in QC next week. ang sarap ng pagkain and it's my first time to hear about this "dirty rice"
Would love to try their wings soon! That hint of spiciness (on the wings) would be nice :D The quesadilla and burrito looks good too.